Not sure where this one falls. But here we go. Seen at Wonderfest and the iHobby expo . We tweaked up some recent photos from the shows. Not a lot to see. 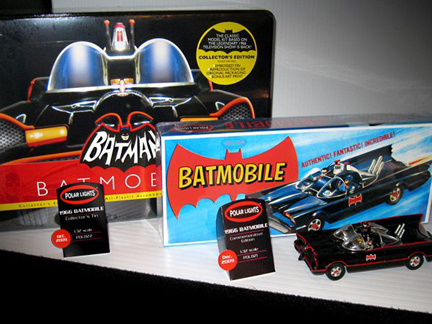 Here’s yet another shot of the Aurora batmobile re-release and the hideous display tin version. Yeah we know. Even though you buried it under thousands of dollars worth of Star Trek promotional displays some of us are still aware that you’re releasing the single most popular Aurora model kit EVER again. Eventually. These are either new slot bodies of the batmobile and penguinmobile, or they’re just 1/50 test shots. 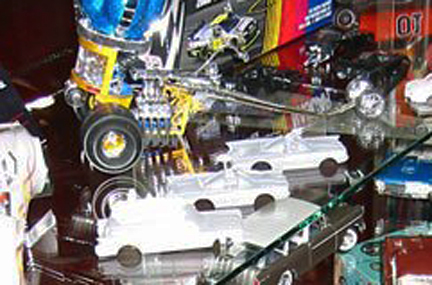 Seems odd to show a resin test shot of a car that is already out and only going through some tampo changes at the most, but the other thing they could be – slot car bodies, doesn’t seem likely either. These pieces look bigger than their proposed scale but it’s hard to say really. Last but not least a quick glimpse at the slot track Bat set. 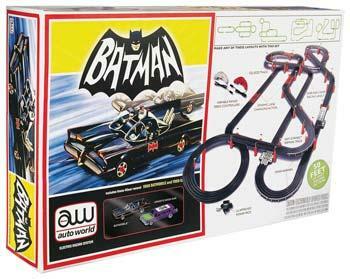 So, looks like a cool Model Motoring Christmas set this year if all goes well.